There are around 250 species of bumblebees across planet Earth, stretching across most of the Northern Hemisphere, from the arctic, right down to the southern-most tip of South America in the Southern Hemisphere. Each bumblebee species has a different distribution and all are an important part of life within their ecosystems. By transferring pollen that helps plants set fruit and reproduce, they are involved in the base layers of numerous food chains, which provide food and shelter for a great multitude of living things (including ourselves). This year, we have decided to show our appreciation for some of the most beautiful and diverse bumblebees from across the world in our monthly Bumblebees of the World blog series, and what better way to start our series than with one of the world’s largest and most iconic bumblebees: Bombus dahlbomii. Commonly known as the Patagonian bumblebee or the Flying Mouse, the South American Bombus dahlbomii is a giant among bumblebees. With queens that can grow as large as 3 cm long - you definitely know when you’ve seen one of these ginormous ginger bees! These majestic bumblebees are not only iconic based on their size, they are also known globally for their story, which sadly, is one of human-caused decline. The decline has been rapid and can be attributed to the introduction of two non-native invasive European bumblebees, Bombus ruderatus and Bombus terrestris. These bees were originally imported to Chile for commercial pollination in agriculture. In 1982 and 1983, hundreds of Bombus ruderatus queens were brought over from New Zealand (from the population originally exported from the UK in the 1800’s) to aid with pollination of red clover, which subsequently led to their invasive establishment in the wild. Bombus terrestris colonies are still regularly imported into the country, where they are deployed in greenhouses and in open fields to pollinate tomatoes, avocados and blueberries. Astonishingly, since 1997, over a million colonies of Bombus terrestris have been imported into Chile. They are now firmly established in the wild and have invaded Patagonia and Argentina. Not only do these invasive bees compete for food resources, but they have also brought novel diseases with them which have likely had a profound negative impact on the native species, much like when the Spanish unleashed a host of new human diseases on the native South American people throughout their colonization of the Americas. Unfortunately for Bombus dahlbomii, the consequences of this introduction have been great and the species is now classed as internationally endangered. Sightings of the legendary Flying Mouse are now much rarer across its once large distribution in southern South America; it has all but disappeared from the north of its known range, coinciding with the range expansion of the two invasive species. 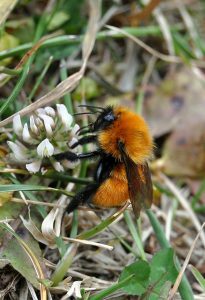 With Bombus terrestris expanding further and further south, there is grave concern that Bombus dahlbomii may not be far away from extinction. This is not only bad for Bombus dahlbomii, but also has wider ecological consequences for the plants it pollinates, many of which are now subject to nectar robbing by the alien species, and also means that non-native invasive plants, such as Scotch broom, are able to spread as their preferred European pollinator is now there to help them reproduce. The damage caused by these alien bees entering South America is now irreversible because the alien species cannot be eradicated. However there are crucial lessons to be learned: animals do not respect international borders and so decisions made by one country’s government can have unintended consequence for neighbouring countries (in this case Argentina did not import non-native bumblebees). This has led scientists to argue for international cooperation on the global trade of species, something which is vital to prevent further cross-border invasions. The global commercial bumblebee trade has been growing rapidly over the last three decades and it is imperative that governments, traders and farmers act responsibly to avoid the consequences of allowing commercial bumblebees to freely enter non-native environments. Many thanks to Paul Williams of the Natural History Museum, London, for his help and advice.